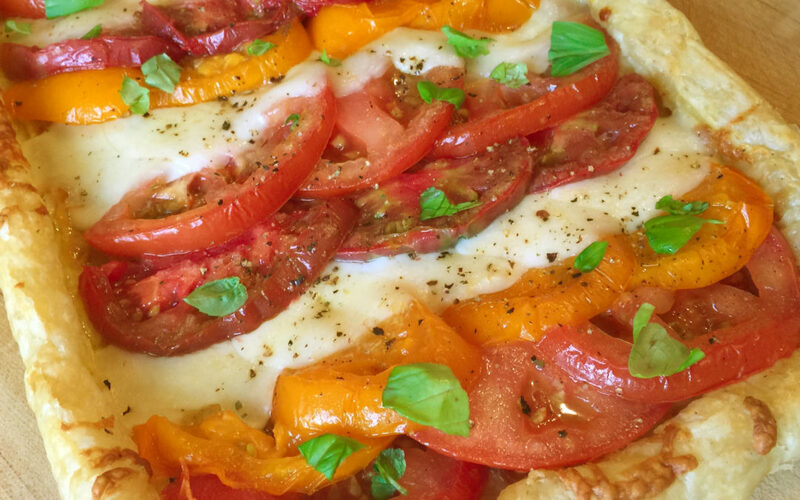 This combination of fresh tomatoes, mozzarella, and fresh basil is the taste of summer. While our tart is perfectly suited for any tomatoes; it’s even better if you can get farm fresh. For our crust, we prefer frozen Dufour Puff Pastry for its flavor and the size. Thaw your crust in the refrigerator overnight, then unwrap, and slide it right into an 8 x12 tart pan. Simply fold the over-lapping dough to form a crust. If you don’t have a pan this size you can use any similar size. Simply sprinkle the puff pastry with flour and rolling it out to fit. Heat oven to 425 degrees. Put a baking sheet in the oven to heat it. Roll out the puff pastry and ease it into an 8″ x 12″ rectangular tart pan using the leftover to make a crust. Using a fork, uniformly poke holes all over the center of the pastry excluding the crust. Using a pastry brush, apply the beaten egg inside the pan. Sprinkle the Parmesan evenly over the egg. Place in the oven on the preheated baking sheet. Bake 15 minutes, then reduce oven temperature to 350 degrees; continue to bake until golden brown and crisp, 15 minutes longer. Remove from the oven. If your dough rises in the center, while it is still hot poke it several times with a sharp knife to release the steam and it will flatten out. Leave the oven on and cool the dough slightly. While shell bakes, place a double layer of paper towels and sprinkle evenly with salt; lay the tomato slices on the salt and lightly sprinkle the top of the tomatoes with salt. Set aside for 30 minutes. Using more paper towels press on top of tomatoes to dry them. Move them to clean paper towels and set aside. Neatly shingle the tomato slices and mozzarella cheese, in rows, using only what you need to make even rows. Mix the olive oil with the powdered garlic. Brush with the olive oil. Sprinkle with fresh grated black pepper. Place back on the baking sheet and bake until shell is browned and cheese is melted, 12 minutes. Cool slightly on wire rack for about 5 minutes to set the cheese, top with fresh basil leaves. Slide onto cutting board and cut into pieces.